I used 8oz. (1/2lb!) 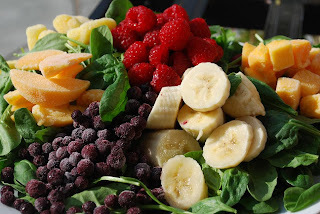 of spinach, water, and a little fruit to add some sweetness to this smoothie. I swear this is the best way to sneak in some veggies and, of course, iron! 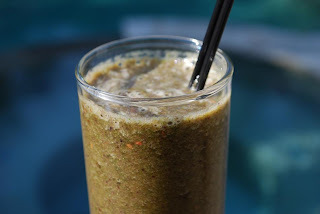 You absolutely do not taste it in this smoothie...seriously! The banana-flax seed muffins are a modification of this recipe, once again from Elana's Pantry. I add two mashed bananas and cinnamon to the recipe...so good!!! The rest of the day I decided that I would give my body a digestive break and try an Intermittent Fast. We'll see how that goes.